I Like Vegetables – By Lorena Siminovich A beautiful board book with bright colors and a bonus…touch and feel! 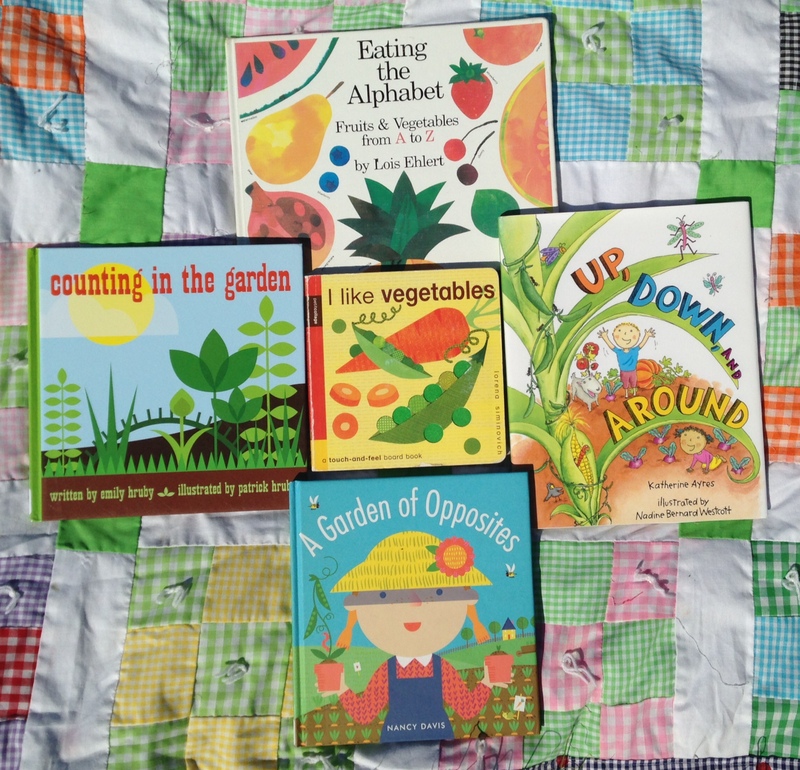 This is the perfect gardening book to start your little one off right. Each page has a few words and a different picture to touch. For sure one they will want to read again and again. A Garden Of Opposites – By Nancy Davis Again, with bright colors and few words, this book is perfectly simple. Opposites never looked prettier. Counting In The Garden – By Emily Hruby I’m just gonna say it…not the best cover art. This is a perfect example of not judging a book by the cover. Once you get past the cover though, amazing! Flowers and vegetables and worms, oh my! Love it! Over In The Garden – By Jennifer Ward Rhyming Song, Yay! This book could actually be read to younger children but I’ve put it in an older category because it has a fact section in the back. Count your way through the garden and see a whole slew of insects along the way. The Gardener – By Sarah Stewart Through a series of letters, Lydia Grace tells the story of her going to live with her uncle in the city until her parents can get on their feet. Lydia Grace was growing up during the time of The Great Depression and during that time everyone was well…depressed. She was determined to make her Uncle Jim smile and by her actions, she made his world a little brighter. Truth time…I teared up. Excellent book! And The Good Brown Earth – By Kathy Henderson This book actually starts in the fall and tells the story of a grandma and a grandson who tend to the garden patch all year long. Having a garden is a lot of work but in the middle of all of that work, there’s always time to play. The Ugly Vegetables – By Grace Lin When a little girl and her Mom start their garden, they look around and see that their neighbors are doing the same, with one exception. Everyone else was planting flowers and they were planting Chinese veges. The little girl was rather disheartened when she saw that their garden wasn’t as pretty as the others. Once it was time to gather some veges and make some soup, everyone wanted a part of the ugly vegetables. Recipe in the back, Hooray! 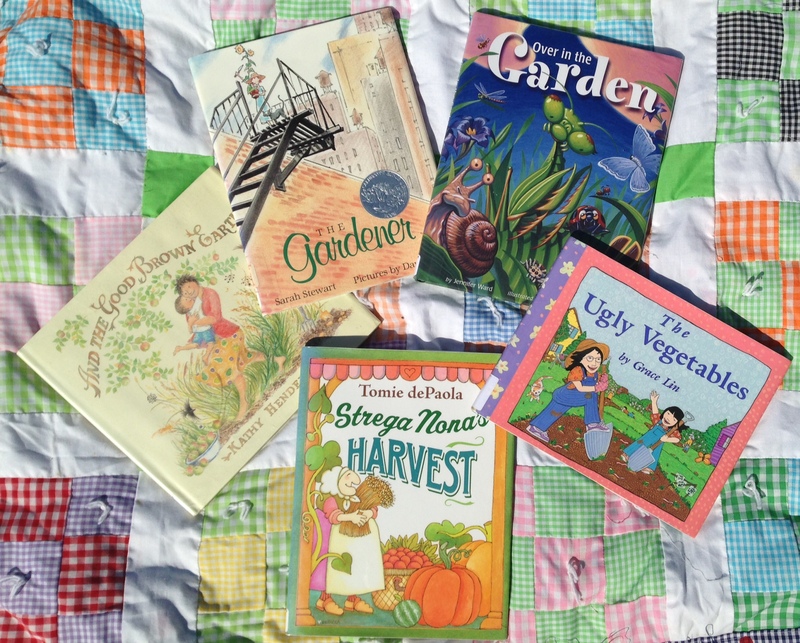 Strega Nona’s Harvest – By Tomie dePaola Strega Nona is well known for her magical way with the garden. She always has plenty of food for her family come harvest time and this year was no different. …except for some reason she keeps getting vegetables at her front door and has nowhere to put them. What is she to do? Why help people out, of course. Great story about sharing and caring. I’ve just finished the newest book in the adventures of Skippyjon Jones the Siamese cat, Skippyjon Jones Snow What by Judy Schachner was a hoot! 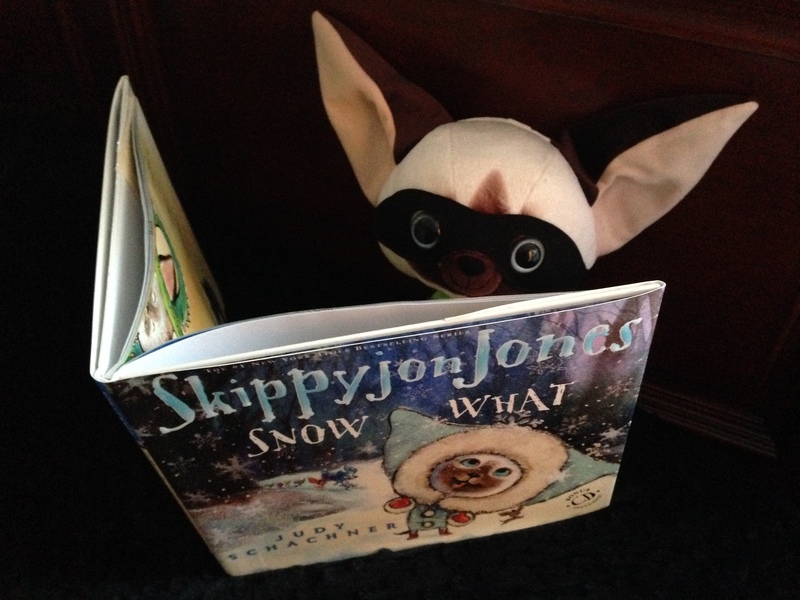 Skippyjon has all sisters and when they want to have Mama Junebug Jones read them the story of Snow White, Skippyjon retreats to his room, takes himself deep into a world of his own imagining and becomes Senor Skippito the Chihuahua. Once in his alternate land, he learns of a girl chihuahua that has been cursed by a witch and needs to be kissed. His first words when he learns of this? “I’m not kissing SNOWbody!” Being he brave knight that he is, he battles dragons, wears tights and even gets his lips frozen to ice while trying to save Snow What. I love, Love, LOVE, Shannon Hale! Can I just be honest? At first, I really didn’t like her newest book. (gasp) …I know…but listen. 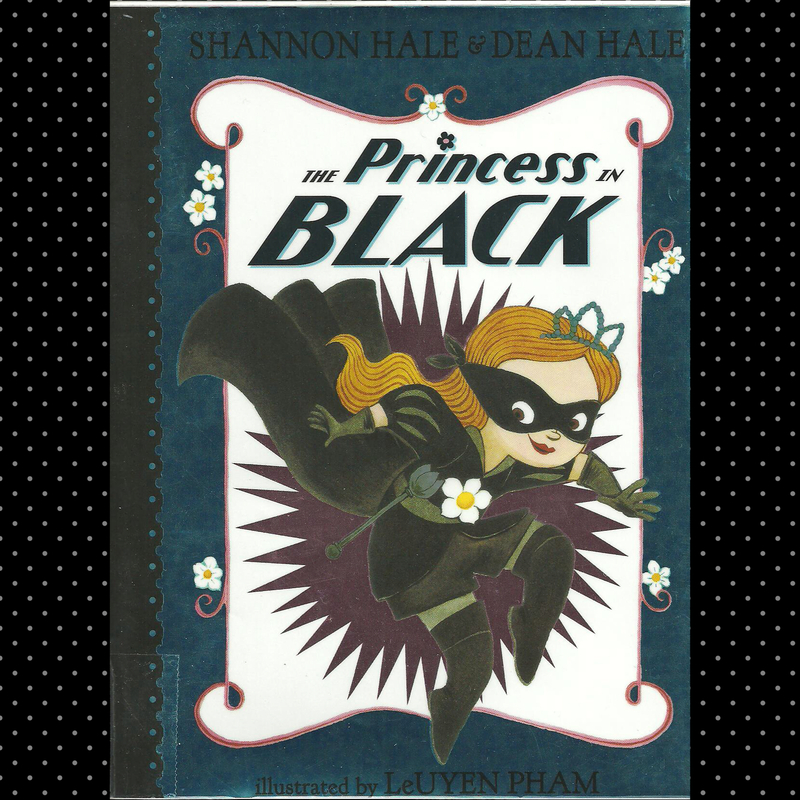 I’ve just finished The Princess In Black and I’ve now decided that it is a great book for beginning readers! I think I was hoping for her normal, “can’t put it down, princess who don’t mess around” book. When I really think about it though, this book is just that except on a lower reading level. So, I stepped out of the box and took a second look at the book. I’m glad I did because I will for sure recommend it frequently. Princess Magnolia (dressed in all pink…of course) is having hot chocolate and scones with Duchess Wigtower, when she is called away to tend to some irritating monsters. By secretly becoming “The Princess In Black”, Magnolia jumps on her faithful unicorn/horse in disguise Blacky and gallops away to fight off the monsters that are plaguing the kingdom. While Magnolia is out fighting off monsters, Duchess Wigtower is convinced there is something suspicious going on. With short chapters and vivid illustrations, this book is a great find for a beginner reader that is transitioning over into “the big stacks”. I’m tellin’ ya though, once your reader hits about 5th grade reading level, pick up The Goose Girl and Princess Academy. They are excellent choices! In a large skillet, saute onion until tender and add chicken. The chicken has to basically warm up so do that until everything is sizzling. In a microwave safe bowl, heat the refried beans for 3 minutes. Once everything is warm, place a tortilla on a microwave safe plate. Place a few pieces of chicken, some onions and 3 tablespoons of the refried beans on the tortilla and roll it up. 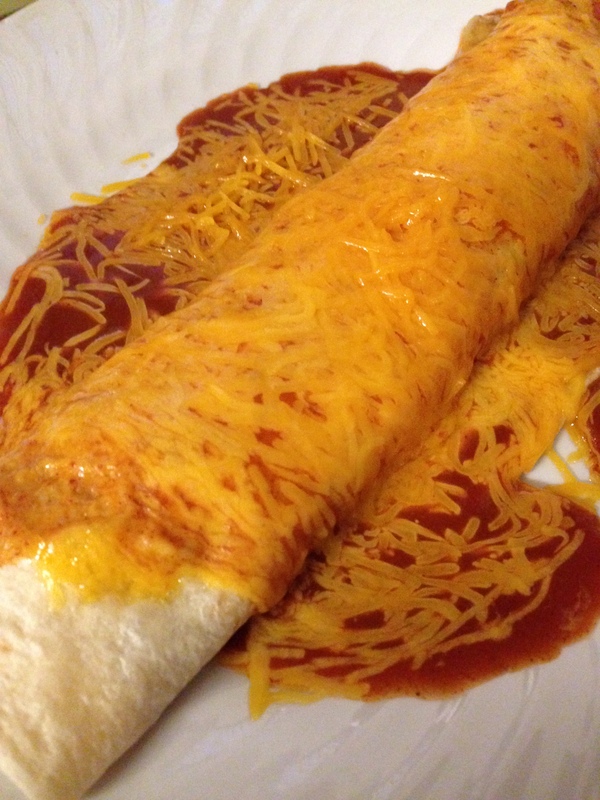 Pour mild sauce over the top and add shredded cheese. Microwave for 1 1/2 – 2 minutes or until cheese is bubbly. Eat IT! Yummy:) Nom Nom Nom! Over the past few weeks, we’ve had multiple sleet/ice events. I, in no way, count that as snow. 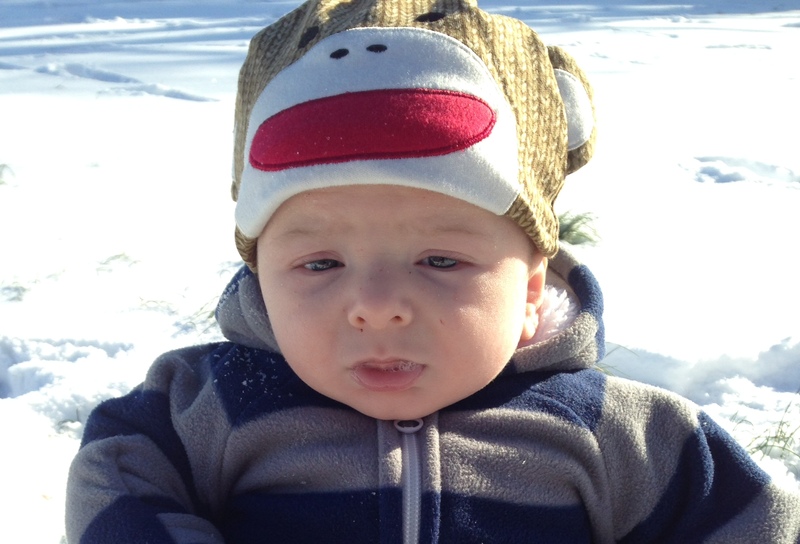 I refused to take our Moonpie out in that mess and declare it his “first snow”. No. Just no. 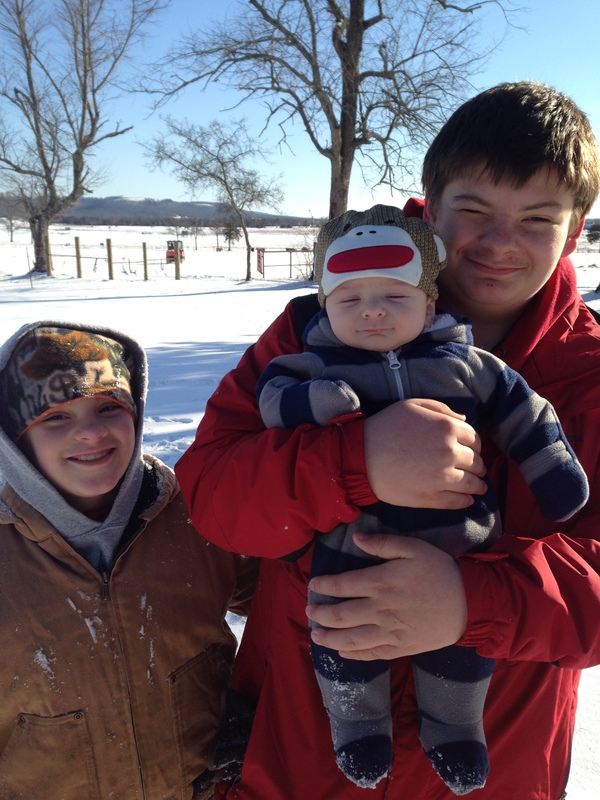 All I wanted was to have one good snow that would cover the ground and for us to be able to make a snowman. Is that too much to ask?! I didn’t think it would take until today for that to happen. Elsa raged at our front door all afternoon yesterday. It literally sounded like she was building her castle…in our front yard. We woke up today to a cozy blanket of snow. I couldn’t have been happier:) Although, not snowman building snow, I did get half of my wish and I’m okay with that.